Keeping your pet’s nails trimmed is, in fact, vital to their health, more so than the livelihood of your furniture and hardwood floors. For dogs, if the nails are excessively overgrown, it can cause them physical pain when walking. When a dog’s long nails constantly touch the ground, the nails push back and exert pressure back into the nail bed and put pressure onto the toe joint (knuckles), which can realign the natural position of the joints of the front legs. 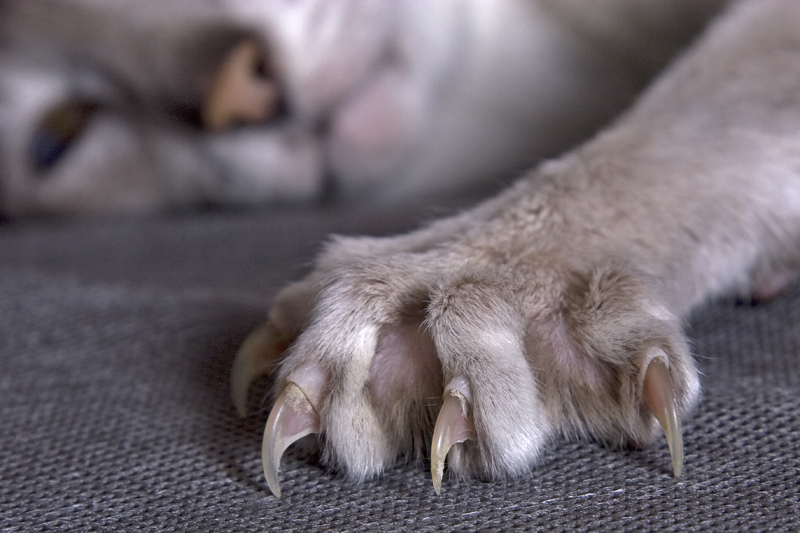 For cats, when the tips of the claws aren’t clipped, they become very sharp and pointy and can get caught in carpet and other similar surfaces and result in painful, broken claws. Not trimming cat claws regularly can also result in extremely painful ingrown nails if your cat cannot successfully “sharpen” their claws. Gently grasp the paw and put one finger on the toe pad and another finger on the skin above the nail. Gently squeeze to extend the nail. Examine the nail for the quick (blood vessels and nerves within the nail). Do not cut into the quick to avoid any pain or bleeding. Repeat with the rest of the nails. Gently grasp the paw in a comfortable position and put one finger on the toe pad and another finger on the skin above the nail. Turn on the grinder and gently press the nail to the grinder to grind the nail down. Do not grind the nail too close to the quick, as it may cause pain and/or bleeding. In order to make sure your pet is safe from harm, do not cut or grind close to the quick. The quick is the pinkish tissue in the nail that contains blood vessels and nerves. If that is cut, it can cause your pet to experience physical pain as well as bleed profusely. To stop the bleeding, use styptic powder as soon as possible. If the quick is impossible to see, like in pets with black nails, cut and grind with extreme caution. As always, if you’re unsure, ask your veterinarian how to keep your pet safe when trimming nails. QuickFinder Deluxe finds the quick for you! The QuickFinder Deluxe Safety Nail Clipper is perfect for large or hard nail dog breeds. These clippers contain a built-in QuickSensor technology that detects the quick and alerts you before you make the cut. When using these clippers, you no longer have to worry about hurting your pet. The clippers have red, yellow, and green indicator lights. When the red indicator light is shining, you are on the quick. As you move away from the quick, the yellow indicator will shine to let you know you are approaching the safe cut zone. When you reach the safe zone, the green light will shine, indicating it is okay to cut. QuickFinder Deluxe is a durable, professional-grade pair of clippers with super sharp blades for a clean cut. It includes a built-in safety latch and has spring-loaded comfort grip handles. Batteries are included. 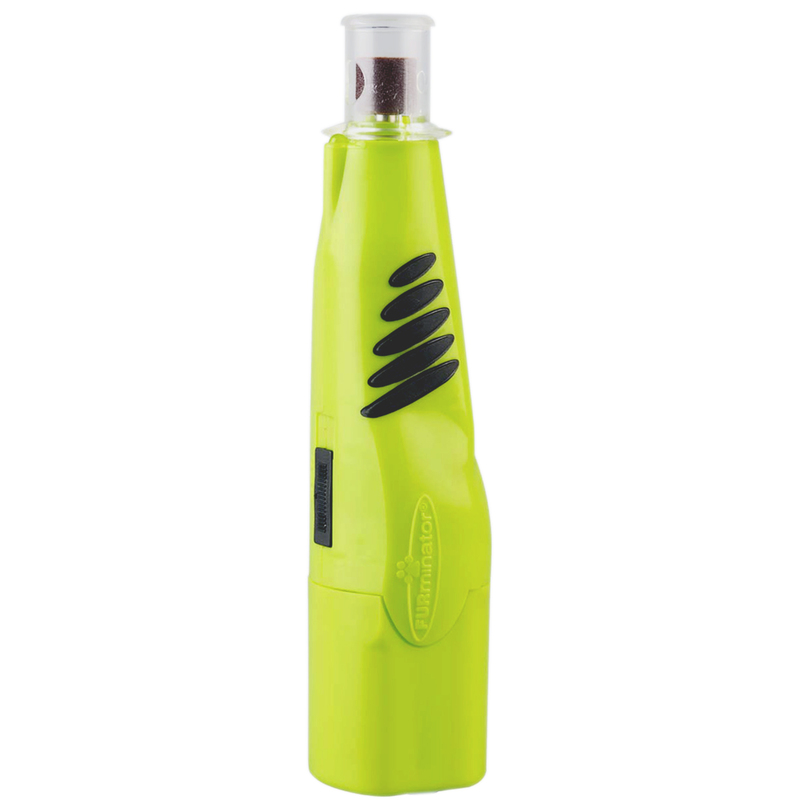 FURminator Nail Grinder quickly and painlessly trims your pet’s nails. The FURminator Nail Grinder is perfect for cats and dogs. It contains a rotating grinding band that safely smooths and shapes nails without leaving sharp edges, something that is common with traditional clippers. The Nail Grinder even helps keep germs and bacteria to a minimum with its anti-microbial plastic casing. This 2-speed, cordless grinder is lightweight and compact, making it easy to handle for a variety of hand sizes. It contains a LED light that illuminates the quick for safer trimming. Each FURminator Nail Grinder works for 100+ hours. Batteries are included. It also includes two grinding bands. Extra grinding bands can be purchased separately. 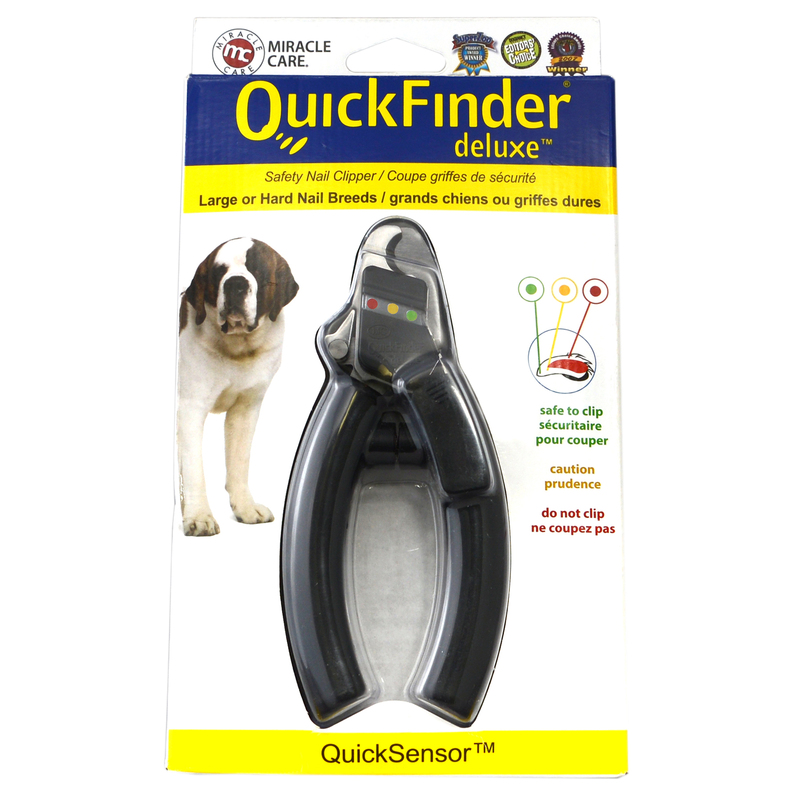 Win a FREE QuickFinder Deluxe Safety Nail Clipper for Dogs or a FURminator Nail Grinder for Cats! Keeping your pets safe is every pet parent’s number 1 priority. Safely and quickly trim their nails with a QuickFinder Deluxe or Nail Grinder! Just leave a comment below, and you could win a FREE QuickFinder Deluxe Safety Nail Clipper or a FURminator Nail Grinder from 1800PetMeds! Two winners will be chosen at random Friday, September 28, 2018, so everyone who participates has a chance to win! There will be a total of two (2) winners. (Limited to residents of the U.S.) Good luck! Congratulations to the drawing winners: Ann J and David W. Look for an email from us! Oh how pup needs his nails clipped!! It’s been on my to do list for too long! I would love to try these, my dog might like having these clip her nails over letting the groomer clip them. Thank you for the chance to win! I have always had problems trimming my dog’s nails. It would be nice to have high quality tools that would boost my confidence. 🙂 Thank you. My Ace is a German Shepherd and has black nails. I always worry when I trim his nails I’m going to hurt him. With this there would be no worries. I could really use these. Thanks for the opportunity to try to win some. I would love to try the clupper on my baby Reba,She is such a dark black baby and it scares me wen I clip her nails.Hope I can win a pair for her. I have two big dogs with black nails… these would be wonderful thank you for the giveaway. I am very nervous to trim my dogs nails. This will surely help! !